Home // Mark Your Calendar // See You at the Concert? See You at the Concert? 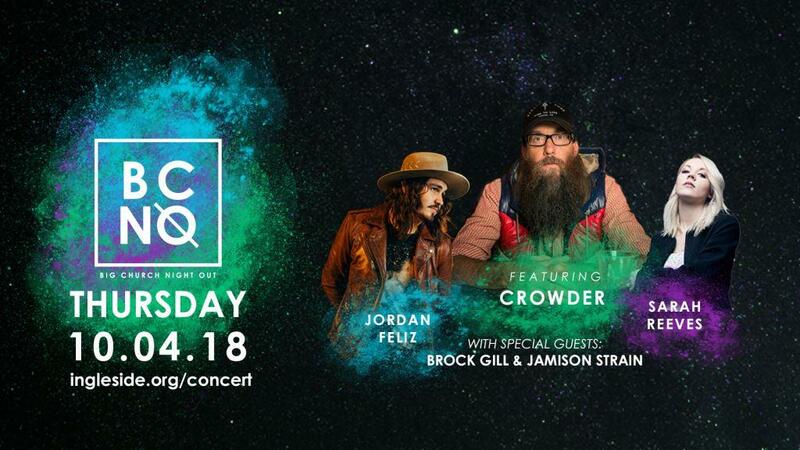 As of this writing, only about 100 tickets remain for our “Big Church Night Out” concert with headliner David Crowder on Thursday night, October 4, in our Worship Center. You may purchase tickets at www.ingleside.org. Just click the “BCNO” banner and it will get you where you need to go. The doors will open at 6:00 p.m. The concert begins at 7:00 p.m. All seating is General Admission, so come early to get the seat you want. I hope to see you for the “Big Church Night Out” concert! As you are penciling in priorities on your calendar between now and the end of the year, I hope you will include these opportunities for growth, outreach, service, fellowship, and worship. Tuesday, November 20, Thanksgiving Celebration, Dinner begins at 5:30 p.m., Worship service at 7:00 p.m.
Sunday, December 2, Christmas Remembrance Service, 4:00 p.m., Chapel. For those grieving the loss of loved ones at the holidays. December 14-16, Christmas Musical Presentations, Friday at 7:00 p.m., Saturday at 4:00 p.m. & 7:00 p.m., Sunday at 10:30 a.m., 4:00 & 7:00 p.m.
Monday, December 24, Christmas Eve Services, 2:00, 3:30, 5:00, and 7:30 p.m.
At our meeting on Tuesday night, September 25, our Overseers elected new officers. For the coming church year, Jason Little will be the Chairman, and Alex Correa will be the Secretary of the Board. I look forward to working with these new leaders, and I know that you will join me in praying the Lord’s favor and wisdom for them and all of our Overseers. I am very grateful for the strong leadership partnerships that have long characterized our church – all for the good of the body and for the glory of God!